Selaginella kraussiana (Kunze) A.Braun, Index sem. hort. bot. berol. 1859: 22. 1860. Protologue specimens (syntypes): South Africa, “In sylvis Zitzikamma districtus Uitenhage in terra detexit Kraus Martio 1839 — Ad portum Natalensem inter Omfondi et Tagela in sylvis umbrosis humidis, et in coronis rupium saxis adpressum; nec non in faucibus umbrosis sylvarum prope rivulum haud procul a Chakas-Kraal legit Gueinzius”. Lectotype (designated by Bizzarri 1975: 577): “Port. Natal.”, Guenzius (K 000351292; isolectotype: P 00065023); paralectotypes in FI and W.
Lycopodium kraussianum Kunze, Linnaea 18: 114. 1844. Didiclis kraussiana (Kunze) Rothm., Feddes Repert. 54: 71. 1944. Lycopodioides kraussiana (Kunze) Kuntze, Revis. Gen. Pl. 1–2: 826. 1891. Selaginella albarracinensis Pau, des. inval. 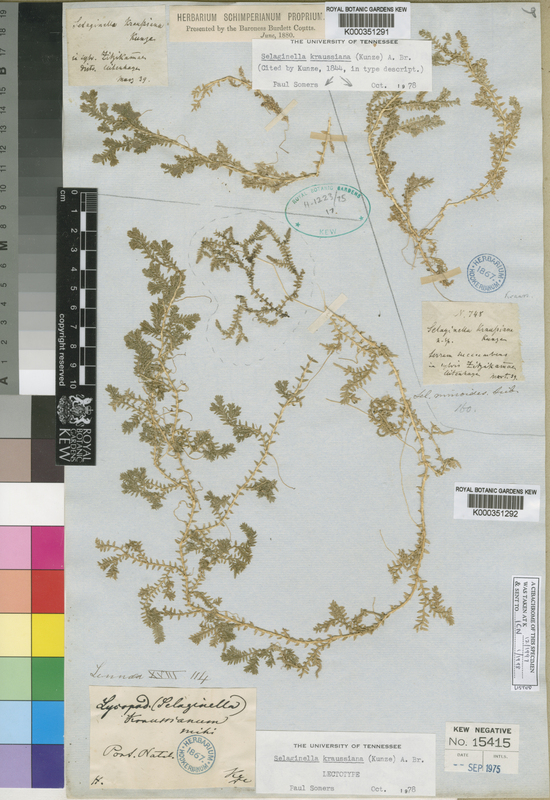 Selaginella azorica Baker, J. Bot. 21: 210. 1883. Lycopodioides azorica (Baker) Kuntze, Revis. Gen. Pl. 1–2: 825. 1891. Selaginella brownii Bull. ex Stansfield, The Garden 13: 415. 1878. Selaginella canescens Fée, Cr. vasc. Br. 2: 99, no. 11, t. 108. 1872–73. Protologue occurrence: Cultivated in the Botanical Garden of Leipzig. Lectotype (designated by Bizzarri 1975: 577): “H. Lips.”, Mettenius (K). Selaginella kraussiana var. aurea W. Bull., Cat. n. 164: 7. 1880. Selaginella kraussiana var. brownii Hort. ex Nich., Dict. Gard. 3: 409 and 411. 1887. Selaginella kraussiana var. variegata hort. Selaginella poulteri Veitch, Cat. 17, f. 7. 1868. Didiclis poulteri (Veitch) Rothm., Feddes Repert. 54: 71. 1944. Lycopodioides poulteri (Veitch) Kuntze, Revis. Gen. Pl. 1–2: 827. 1891. Selaginella kraussiana var. poulteri (Veitch) A.Braun, App. Ind. Sem. Hort. Berol. 8. 1871. Corse (introduced), France (mainland France, Channel islands introduced), Portugal (introduced), Spain (introduced). Italy (introduced), Sicilia (introduced in Sicily (island)). Azores (introduced in Corvo, Faial, Flores, Graciosa, Pico, Santa Maria, São Miguel, São Jorge, Terceira), Canary Islands (introduced in Gran Canaria, Hierro, Tenerife), Cape Verde (Boa Vista, Brava, Fogo, Maio, Sal, Santa Luzia, Santiago, Santo Antão, São Nicolau, São Vicente), Madeira (introduced in Madeira). China South-Central (Guizhou (introduced), China Southeast (Guangdong (introduced)). Norfolk Islands (introduced), New South Wales (introduced), South Australia (introduced), Victoria (introduced). New Zealand North (introduced), New Zealand South (introduced). Hawaii (Hawaiian Islands, introduced in Oahu, Maui, Hawaii Isl.). Alabama (introduced), Georgia (introduced), North Carolina (introduced), South Carolina (introduced), Virginia (introduced). Bizzarri, M.P. 1975. Adumbratio florae aethiopicae. 27. Selaginellaceae. Webbia 29(2): 545–593. doi: 10.1080/00837792.1975.10670031. Reference page. USDA, ARS, Germplasm Resources Information Network. Selaginella kraussiana in the Germplasm Resources Information Network (GRIN), U.S. Department of Agriculture Agricultural Research Service. Accessed on 08-Apr-12. Euro+Med 2006 onwards: Euro+Med PlantBase – the information resource for Euro-Mediterranean plant diversity. Selaginella kraussiana. Published on the internet. Accessed: 2016 1 8. Hassler, M. & Schmidt, B. 2015. World Ferns. Checklist of the Ferns and Lycophytes of the World. Version 5.61 - December 2015. Accessed 8 Jan 2016. For more multimedia, look at Selaginella kraussiana on Wikimedia Commons. This page was last edited on 13 February 2019, at 17:55.